Curley Taylor and his band, Zydeco Trouble, hail from the heart of Creole country in Louisiana. Taylor’s soulful vocals and the band’s hard-driving zydeco dance beats are the product of musicians who have been deeply immersed in the unique, deeply authentic music of Central Louisiana all their lives. Taylor began his professional career at 16 by playing drums in his father’s popular band, followed by stints on drums with many Louisiana legends: Steve Riley, L’il Buck Senegal, Geno Delafose and others. While traveling with CJ Chenier’s band, he picked up an accordion and got hooked on the immediate emotion and natural feeling the instrument evoked. Within months he learned to play, though he continued to drum in zydeco’s most popular bands. In 2003 Taylor formed Zydeco Trouble. His debut, Country Boy, was released to rave reviews. 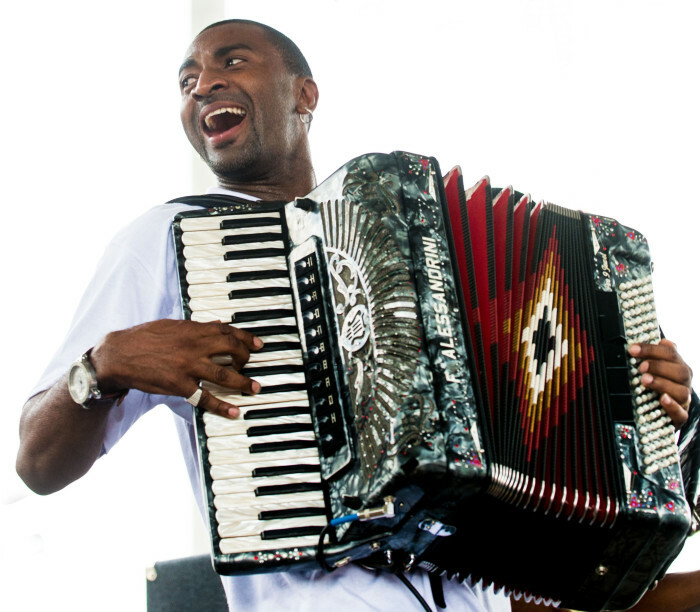 Zydeco Trouble has been touring and recording ever since, often playing to audiences who have never heard zydeco music. The band has made fans at venues as diverse as the Waterfront Blues Festival in Portland to Jazz Fest in New Orleans. When at home in Louisiana, you can find Curley playing in one of the local clubs around the Lafayette/Opelousas area to the delight of his hometown fans.